Afraid to Ask Series: Can I Feed My Pet Table Food? At Town N Country, this question is raised frequently, and the answer might not be that scary one you’re anticipating. You’re about to read ground-breaking,earth-shattering, life-changing, paradigm-shifting, ghost-busting information. Yes, you can feed your sweet furry baby table food. Breathe deeply and wait a moment for your shock to subside before you continue. Okay, there’s a caveat or two. Take a medi-gap. 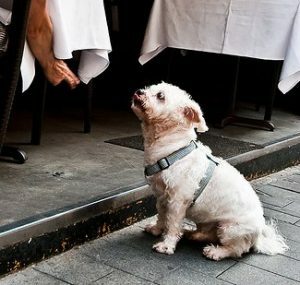 If your pet has any medical condition, consult with your vet before you offer table food. Moderation matters! If your pet has eaten kibble exclusively, introduce new foods gradually in small amounts. Live on the edge. When you shop at the grocery store for your pet’s table foods, the best aisles to choose from are on the outside where you’ll find fresh (and frozen) fruits and veggies. Avoid toxic foods. Some foods can cause digestive problems for your dog or cat. You’ll find examples here of what to avoid and what to offer from time to time. Consider weighty matters. If your pet’s overweight, help him return to a healthy weight before introducing table foods. Talk to us and discover the best way to do that! Special foods are available at Town N Country. Boneless is beautiful. As normal as it seems, bones – even for chewing – are not recommended. Chunks of cartilage can easily be chewed but unfortunately can’t easily be digested. Risks include obstruction that may require surgery, fractured teeth that would require extraction and GI upsets that can make everyone in the house uncomfortable. Reflect on Raw. Nature’s Variety Instinct Raw Frozen Diets offer your pet what she craves most: meat in just-right portions that have been flash frozen for optimum nutrition and convenience. Find out more. If the idea of adding a little food to your pet’s diet is brand new to you, talk to us about portions, transition and your pet’s overall nutritional needs. Afraid to Ask Series: How Did We EVEN Get Fleas? You know the telltale signs. The scratching. The bites. The little flecks of blood. And then you actually see one…scurrying away, or springing up at you…you have fleas. Even at Halloween? Unfortunately, cooler weather doesn’t automatically wipe out fleas, so don’t give up your pet’s flea prevention treatment just because it’s fall. If you postpone or forget, your furry baby won’t be protected from the disaster-invoking, blood-sucking, parasitic varmints in your neighborhood. At Town N Country, many dogs and cats come in with fleas –and it can happen almost any time of year. It’s no reflection of your housekeeping abilities, because fleas can make their way into any house. Once inside, persistent fleas have been known to take up residence in the cracks of hard wood floors until a suitable host rambles past. • Bartonella. Also called Cat Scratch Fever, this can be passed on to humans from cats with the strain. It also can be transmitted by a flea or tick bite. Lab blood work will confirm Bartonella which requires antibiotic treatment. • Flea Anemia. The cat or dog that doesn’t scratch but has an infestation of fleas continually loses blood. Your vet can test for damage and recommend the best intervention. • Flea Allergic Dermatitis. You may see hot spots on a dog or cat where they have bitten and scratched the hair – and even the skin – off. These could indicate an allergy to flea bites. Recommended treatment focuses on ridding fleas from the cat or dog as well as their environment. Even Handed. But don’t stress when you discover that your dog or cat has fleas as the solution’s fairly straight forward. At Town N Country, your pet will receive proper treatment that will drive out the fleas and keep them from ever coming back. Currently our best products for flea prevention are Vectra, Trifexis, and Capstar. 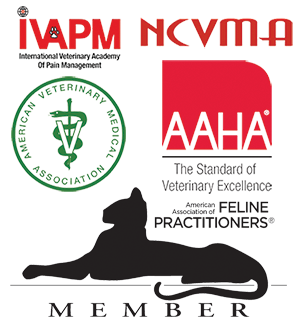 Call to set up an appointment; let’s discuss what’s best for your pet. The right treatment can take the horror out of your next Halloween. Afraid to Ask Series: What’s that Smell?! It’s October, time for the wonderful scents of pumpkin spice and burning leaves. But at your house, you’ve started to smell something more in line with the horrors of Halloween! We know. You’re afraid to ask. But seriously – what is that smell? It’s the start of a good scary mystery. We’re All Ears: The most easily recognizable symptom for a yeast infection in your dog’s ears is a foul scent. In many cases, the ears are not itchy, just smelly. Down in the Mouth: Dental disease stinks – literally. 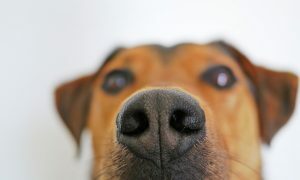 Although doggie breath is usually very noticeable, the source of that funky fragrance is difficult to detect in cases where the pets don’t pant. If your pet hasn’t had a dental evaluation lately, that bad breath may hint that it’s time! Here’s the Skin-ny: Yeast infections on your pet’s skin are also indicated by a distinctly pungent smell. Typical locations for yeast infections are around nail beds, between toes and skin folds. Look for fur or nail beds that are discolored a red brown. Bacterial infections usually create some sort of rash on the skin. When you find the likely suspect – or when you need a Watson to your Sherlock-ing – give us a call. We’ll help you find a solution to the mystery of the foul smell. What really happens if I miss my HWP/Flea Prevention? It diabolically grows inside your cute, furry babies and cuts off their blood supply, slowly, darkly…deadly. How scary is that?? You see the Halloween decorations everywhere, but – contrary to popular belief – scary heartworm disease knows no specific season. As many parts of the United States experience urban sprawl and expansion, mosquitoes continue to multiply and create problems for numerous mammals all year long. I want to bite your pet. That’s why you don’t want to forget Heartworm prevention medicine. Without that protection, your pet is one mosquito bite away from a life-threatening disease. Your dog won’t realize that the barely perceptible bite just shot tiny larvae into his blood stream, and neither will you. Scary host stories. 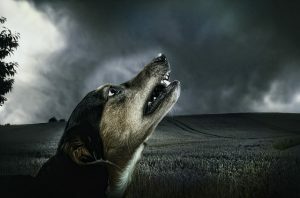 Coyotes, foxes and dogs can be common hosts of heartworm disease. A single host animal can carry literally hundreds of worms that can grow as long as one foot! Worse than any nightmare on Elm Street, the worms effectively block the blood flow to major organs like the heart, lungs or liver. Cats aren’t typical hosts, but when infected, they do not usually survive until the larvae have reached adult stage. The worms crawl in. By the time the tiny larvae develop into adult stage inside your dog (and even earlier in your cat), your pet could experience pulmonary hypertension, aneurism or heart failure. When you look closely at what heartworm disease can do to your dog or cat’s body, you’ll choose prevention over the cure every time. One infected mosquito bite can drastically affect your pet’s life if she’s not protected. Talk to us about annual testing, and the best preventive medicine for your cat or dog. It’s one simple step that could save your pet’s life. Congratulations, Tyger! And – he is cute, don’t you think?! 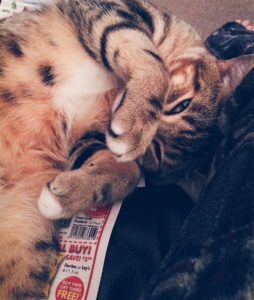 PS You can see all of our Cute Cat entries added to our pet gallery!